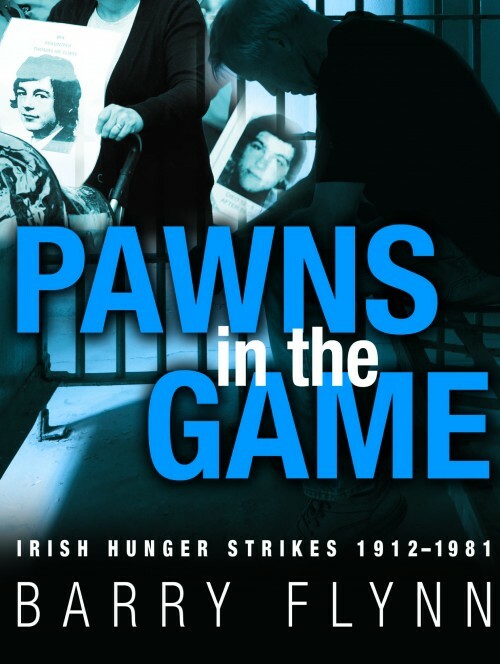 William Butler reviews Pawns in the Game Irish Hunger Strikes 1912-1981 by Barry Flynn published by the Collins Press in Cork at €12.99. In ancient Ireland one of the few ways for an individual to pressurise a person of higher status into conceding justice, was to fast against him. This was a tactic of last resort a political protest of the highest order and one that never failed to illicit a response. However this tactic was to disappear for many centuries only to reappear in Ireland at the beginning of the twentieth century. In Barry Flynn’s Pawns in the Game he profiles the men willing to undertake hunger strikes in order to achieve their ideological goals as well as the political fallout of those strikes. Hunger striking was re-introduced into the Irish political landscape by the suffragettes. For the first time in modern history a government was forced to face the challenge presented by the hunger striker. For to do nothing was to condemn the prisoner to death, attempting to force feed the individual was extremely dangerous occasionally leading to death, but to release the individual was to lay the government open to the risk of being deemed ‘soft on crime’. The ultimate no-win scenario for those in power, a clash between idealists willing to sacrifice themselves for the cause and politicians used to compromise unable to do so for fear of undermining all that they represent. At first the British Government unwilling to watch a woman starve herself to death while in their custody introduced the ‘Cat and Mouse bill’ releasing the striker when her life was deemed to be in danger. However each government approached hunger striking differently and thanks to a mixture of idealism, fanaticism, indifference and principal men died. Flynn’s book examines the stories of the twenty-two Irishmen who died on hunger strike during the twentieth century. His brief profiles on each man do not go into great detail on their background and career instead it focuses on how they were arrested and why and to what the circumstances where that drove each man to protest in this way. Flynn’s main emphasis is not on the psychological reasons for hunger striking but on the fall out, the public reaction or on occasion lack of to each strike. Flynn’s book is a passionate, sympathetic study of the human tragedy behind each one of the twenty-two deaths. A well researched, extremely readable book Flynn is at his best when describing the conditions of the prisoners and the individual government’s responses to each case. His brisk, emotive prose is often harrowing; the chapter on Frank Stagg is particularly striking. The human tragedy is at the heart of his study and the horror of starving oneself to death shines through in each case. But what really sticks with the reader is while Terence MaSwiney and Bobby Sands are household names the fact is that so many of the hunger strikers have been forgotten. However the book has flaws caught up in the terribleness of it all Flynn’s portrayal of government ministers, both Irish and British occasionally falls into caricature. Men are damned simply for refusing to give into the demands of the hunger strikers, whatever reasons for their stands are never explored. Near the end of the book Flynn briefly examines the controversy surrounding Richard O’ Rawe’s Blanketmen (where O’Rawe suggested that a political deal was offered earlier than admitted a deal that would have saved lives). With the result that Flynn rejects O’ Rawe’s account. However it is too brief an examination for such a polarising argument which is a pity as it will lead to further debate rather than ending it. Flynn’s book is a useful source of information on the hunger strikes but his decision to use citations rather than footnotes may be an error in this regard. A worthy introduction to the subject, Flynn’s book is a passionate, sympathetic study of the human tragedy behind each one of the twenty-two deaths. Occasionally it is one-sided, in places it lacks detail where detail is essential, but having said that the author’s interviews with some of the surviving hunger strikers are revealing and will be an important element in any further research on the subject. Flynn’s Pawns in the Game will no doubt cause controversy but that is no bad thing if it leads to further research. Written by: william butler on 17 December, 2011.